Year 3 of the college football quest begins with a doubleheader. This is the first doubleheader of the quest. I don’t expect that there will be too many doubleheaders because a significant part of the enjoyment of this quest is having the full experience at each school. But there will be times where it makes sense to combine two games on one trip. This was a good situation to go to a Friday night game at Cincinnati followed by a Saturday game in Oxford, Oh at Miami University. The trip started with, the becoming way too common, early wakeup call on Friday for the flight to Indianapolis. Two things here: First, the flight was 8 am, so as I note this is early, the flight to Moline in November will be at an ungodly hour. Secondly, why Indianapolis you say. Well, when this trip was first designed the Saturday game was going to be Connecticut @ Louisville, Purdue @ Ohio St., Georgia @ Kentucky, or Ohio @ Miami. Therefore, we tried to book as central as possible to give us maximum flexibility. That and Delta’s monopoly of LaGuardia to Cincinnati made Indianapolis a much cheaper option. At LaGuardia (probably the worst airport in the nation), hilarity ensued. I am not sure if it was the lack of sleep or the giddiness of the first trip of the year but our minds were clearly off kilter. Try this thought exercise…If Al brought a large bottle of saline solution for his contacts, it would be confiscated by security for being more than 4 ounces. Yet some women are allowed to “carry” larger quantities of saline (sometimes much larger quantities) through security without a problem. Things that make you go hmmm. Also, curiosity ran amok during the “What do you think she is wearing underneath that trench coat?” debate. The beauty of security procedures was that we got to find out. Also of note, Al’s iphone now auto spells Singerpedia. Those of you following the entire history of these trips should find that interesting and yet ominous at the same time. We landed in Indy without incident, which is always the best way to fly. We grabbed the rental car and set off for Cincinnati, a two hour drive. Driving through Shelbyville, home of the Shelbyville Shelbyvillians, we encountered very smooth wide lanes on the highway. Kramer must have been there. We also noticed mile markers every 0.2 miles. Again! Was this a political boondoggle or did one guy manage to convince two states this was a good idea? Maybe it was state welfare in the dig a ditch, fill a ditch model. I’m not sure but I want to get into the mile marker manufacturing business. We drove past “Casino Live”. This led to a debate about whether that meant live table games, live horse racing or something else entirely. The answer would come shortly. We stopped for lunch and witnessed a first in the history of Americana, a clean White Castle. I should say that I like White Castle. That is why we stopped there for lunch. But I have never been in one that was clean. Turns out, it had only been open for a week. I guess the cleanliness will be short lived. We also saw some employees of Casino Live, so we asked what the deal was. It turns out “Casino Live” is their brand, not live table games. Seems like false advertising to me. Normally, we would make plans to stop on the way back to the airport, but we are going to UConn later in the year and that is near Foxwoods and Mohegan Sun. No need to lose money in different states on multiple trips in a year, one is enough. Continuing on to Cincinnati we passed many more billboards for casinos / racinos. I did not realize Indiana had such a gambling problem. Good for them! 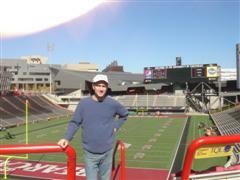 We went directly to the University of Cincinnati campus and Nippert Stadium. My first reaction was this is not a stadium but a hole in the ground. Al was not so kind calling it a pit. Let me explain. First, the stadium is not really a stadium. It appears as if they dug a big hole in the ground, poured in some concrete, and attached benches to it. Then they built an upper deck on one side. This is the only part that could be considered a stadium. There was no barrier around the field. The school puts up temporary metal barriers around the stadium to control access, but there is no permanent barrier. Like I said, it really is only just a hole in the ground. This is a venue that looks a lot more impressive on TV than it does in person. We walked around campus, which has a lot of hills and was very tiring. We tried to find some high ground to get a good aerial picture of the stadium. An elevator maintenance guy told us about a dorm which had a very good view of the stadium. He was 100% correct and led to some great pictures. Clearly security was somewhat lax as we were able to walk right into the dorm. Good thing we are fine upstanding pillars of the community. It was during our walking tour that Al discovered he needs a uniform on these trips so that he can access rooftops to get better views because “No one ever questions the janitor”. Me and my fear of heights will sit that out in the future. 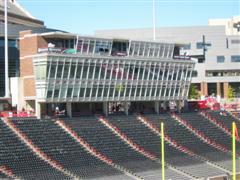 One question for the campus designer, when you have a building with a room that overhangs the stadium offering excellent views, why do you put in triangular windows that are so small you cannot see anything. I would make the whole room out of glass. One interesting thing was that you could actually see the stadium scoreboard from many points across campus including the student center and dorms. This is great for those without tickets as you could see the game play itself out on the scoreboard. I also have to give kudos to the parking situation. There was plenty of parking and it was well designed, which is not normally something you see on a college campus. In the “that is very creepy category”, Al mentioned he wants a job on a college campus. One whose job requirements are girls need his services and bribes are encouraged. He continued on that it can’t be teaching because that is too complicated for him. I fully agree on the second part, but I am curious about Al’s educational background such that he thinks bribes are encouraged in teaching. Maybe diversity officer (this comment will make sense after the Miami write up)! I digress with a random question, why does the Catskeller, where we killed some time with a few drinks before dinner, have more employees than customers. Nice beer list Catskeller! With game time rapidly approaching, it was time to find dinner. 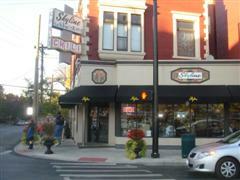 We were advised to go to a local pizza place whose name eludes me or Skyline chili. I vaguely remembered Skyline Chili was a famous Cincinnati thing so we opted for that and a significant walk to the nearest one. Someone please to tell me why this is famous. I do not get it. It was not very good and that is being kind. I liked the idea of chili on spaghetti, but the chili was not very good and the pasta (which is very tough to ruin) was poor. 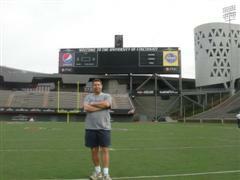 Not very satisfied from dinner, we embarked on the long uphill trek from Skyline Chili to Nippert Stadium. On the way, we had to stop for some gum. Has anyone out there in internet land lasted more than 10 chews with Fruit Stripe gum? If so, you hold the world record. The family tailgate section was a lot of fun. There was lots of stuff to do, food, games, etc. There was also a live bearcat on display. It did not seem very ferocious. 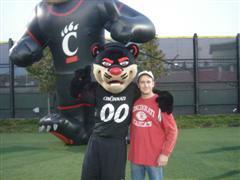 Something called a bearcat should be ferocious. There is just something electric about a primetime college football game and you could feel it in the air. 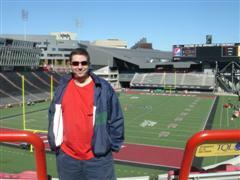 We entered Nippert Stadium to 53 degrees and clear. Take note, it was clear. It did not rain at all during this game, a rarity on the quest. 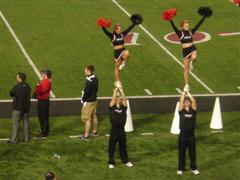 The first observation upon entering Nippert Stadium, was could Cincinnati have any more cheerleaders? Don’t get me wrong, I did not mind it, but they seemed to have 60 cheerleaders of various varieties on the sidelines. Plus, they rotated sections throughout the game. 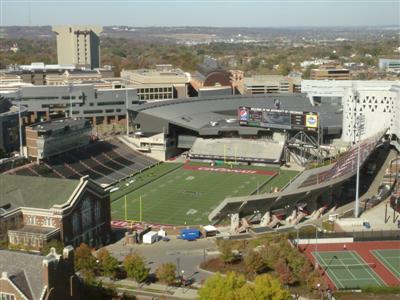 Interestingly, Cincinnati serves alcohol on campus at the stadium during the game. This is a rarity. A school that treats its fans as adults and does not punish the majority for the reckless drunken behavior of a few. Kudos to the administration for this attitude. Punish the few who misbehave and not penalize the majority. I hope it lasts and other schools take note. The game started slow but really picked up in the second quarter. Both Al and I thought this would be a relatively easy win for Cincinnati, but Collaros (the QB for Cincinnati) had a game to forget and USF controlled pretty much from start to end even though USF never had a lead more than two scores. I challenge anyone to tell me a more annoying sponsorship than Fifth Third Bank. At every TV timeout, and you all know there are lots of those, Coach Jones came on the scoreboard and announced that Bearcat football was presented by Fifth Third Bank. Well, I will never be a Fifth Third customer. 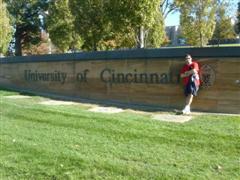 I would be remiss if I did not chastise the Cincinnati fan base a little bit. This is a school that had not lost at home in a few years. In the fourth quarter, USF took a 15 point lead with 9:32 left in the game. A significant departure of fans was noted. It looked like a third of the stadium left. 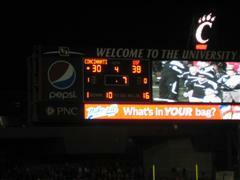 Cincinnati was not playing well and it looked like they had no chance to win. But 15 points is only two TD’s. You absolutely cannot leave this game. 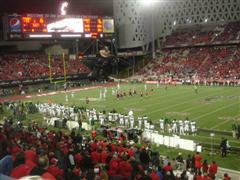 Cincinnati pulled to within 8 points with 5 minutes left and only two thirds of the fans were there to see it. You absolutely cannot abandon your team like that. Especially given how high power an offense they have and how much time was remaining. I fully realize I am chastising a few and not an entire fan base, which is contrary to my alcohol point above, but I don’t care. Al – Who did Cincinnati play in their bowl game last year? Al –Wasn’t it the Gators? I am embarrassed just typing that. The second example comes during the Miami game. The game ended and we headed to downtown Cincinnati. As it was late, we went directly to the hotel to get an early start to Oxford the next day. The Hyatt Regency Cincinnati was not what I expect of a Hyatt. We got a discounted rate so I could not complain too much, but at 12am it should not take 10 minutes to check in, as all kiosk check in machines were not functioning so I had no choice but to wait for the only clerk at the front desk. The room was clean enough but it was very run down and in general the hotel was not up to typical Hyatt standards. I think the hotel’s business model is to break even on the hotel and make money on just the parking. This trip will continue under the Miami (Oh) write up and will come full circle with us returning to the Cincinnati campus on Sunday morning. South Florida would use this win to catapult their season to an 8-5 record and a win over Clemson in the Meineke Car Care Bowl. Cincinnati would go in the opposite direction and finish the year with one win in its last 6 games and end with a 4-8 record.